The Ports of Cincinnati and Northern Kentucky is the #1 inland marine port in the United States with more than 43 million tons of domestic cargo transported each year. This is equivalent to nearly two-million truck loads! 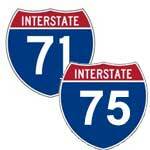 For over the past half century, the OKI Region has been shaped by the I-75/71 corridor. Today, 60% of the region’s population and 75% of our jobs are located wihtin five miles of the corridor. 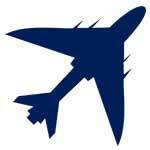 The 2010* to 2017 Average Annual Growth rate for regional air cargo was 14%. In 2017 alone, the Cincinnati/Northern Kentucky International Airport (CVG) handled 1.1 Million tons. July 2018 marked the 24th consecutive month of Year-to-Year air cargo growth – leading the region’s forecast for air cargo to continue on its remarkable trajectory. *2010 was the first full year for DHL at CVG. 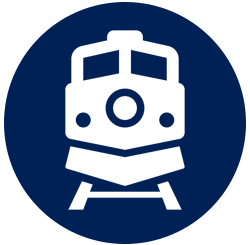 Railroads carry over 18 million tons annually in, out and through the OKI Region. Rail volume is forecasted to increase 38% by 2040. In the most recently published data (2016), Chicago and Cleveland continue to be the largest sources of rail freight terminating in Cincinnati while Detroit serves as the biggest market for rail shipments originating from the OKI region. Since 2007, OKI staff and members have been actively engaged in freight transportation planning due to its critical impact on the region’s socio-economic well-being. The efficient flow of goods, employees and customers ensures a healthy and robust regional economy. OKI is the leader for the tristate region in terms of freight transportation planning for all modes. OKI’s freight focus is on the application of new, emerging technologies, enhancements in the collection and application of freight data, and public/private partnerships at the local, state, national and global level to enhance opportunities for socio-economic growth. Explore infrastructure along the Ohio and Licking rivers via this interactive map. Explore train count data in the OKI Region via this interactive map. Truck parking is a critical issue in the OKI Region. See below links to two Smart Phone apps that are available to provide truck stops, available parking nearby, weigh stations status, fuel prices and other information. describe how the State will invest and match its National Highway Freight Program funds. Businesses and industries are dependent on an efficient, reliable, interconnected and safe freight transportation system. OKI’s central location and extensive transportation network continue to make the region a top choice for manufacturing plants, distribution centers and warehouses. Continued growth in freight across all modes will place significant demand on the region’s transportation networks. This will require OKI’s continued attention to system preservation and maintenance, public/private partnerships, and the integration of innovative design and technologies to optimize existing operations. Trucking in the OKI Region is forecast to increase about 63% by 2040. Most of the commodity gains are projected to be increasing volumes of secondary traffic (movements between warehouse and/or retail locations), nonmetallic minerals, and farm products. The OKI Region’s freight exports exceed $52 billion a year and continue to grow. The largest amount of outbound freight is destined for neighboring Midwest states and global markets via the nation’s east, west and Gulf ports. 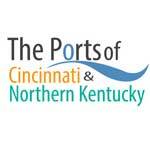 The Ports of Cincinnati and Northern Kentucky is the largest inland maritime system in the United States. Shipping on the Ohio River provides an average transportation savings of $10.67 per ton over the cost of shipping by alternative modes. Combined, the OKI Region’s three intermodal rail yards operate over 185,000 annual lifts of containers. I-71 and I-75 serve as a backbone connecting the OKI region to the largest cities of Ohio (Columbus and Cleveland), Kentucky (Louisville and Lexington) and Indiana (Indianapolis). Combined, the OKI Region’s three intermodal rail yards operate over 185,000 container lifts per year.